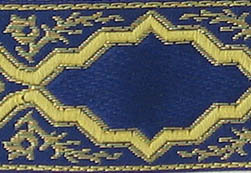 These trims can be sewn onto our garments or purchased by the yard for you to stitch on yourself. They are washable, I would recommend on gentle and dry cool. Width and repeat lengths (between patterns) are in inches. Click on pictures to see more detail.